About: Okuda was born in Santander, Spain on November 19, 1980. He is based in Madrid since 2000 with a Bachelor of Fine Arts from the Complutense University of Madrid. Okuda’s work can be classified as pop surrealism with a clear essence of urban art. His artwork is composed of geometric prints and multicolored ephemeral architectures that help blend with grey bodies and organic forms. These pieces of artwork often raise contradictions about existentialism, the universe, the infinite, the meaning of life, and the false freedom of capitalism. They help ignite conversations about the clear conflict between modernity and our roots. Okuda began his career as a street artist by painting in old factories and lost railways in 1996. Since 1997 his works have been recognized on roads and the factories in Santander. By 2009 he hit a major point in his career, doing gallery shows in New York City, Berlin, London and Paris, reaching more mature audiences. Okuda is inspired by surrealism art, pop art, traveling, films and the environment, such as people around him, fashion, music, and his everyday life. His beliefs revolve around his freedom to create art and staying positive. He does not believe in religion but believes that “God is inside every individual”. The best way to live life is to be good and a peaceful person. In 2017 he painted a monumental mural with two gigantic colorful skulls on the facade of the Castle of La Valette, in Pressigny-les-Pins, France. He was also invited to pain an old church in Denver, Colorado, now dedicated to the consumption of cannabis. Now known as the International Church of Cannabis, this former church has been transformed into a sanctuary for cannabis smokers, offering consumers a place of peace and meditation, in order to achieve their spiritual goal in serenity. The International Church of Cannabis is the third church painted by artist Okuda after the project “Kaos Temple”, a skate park in a church, and “11 Mirages to the Freedom”. Where you can see it: His works can be seen in streets and galleries around the world: India, Mali, Mozambique, United States, Japan, Chile, Brazil, Peru, South Africa, Mexico and the European continent among others. 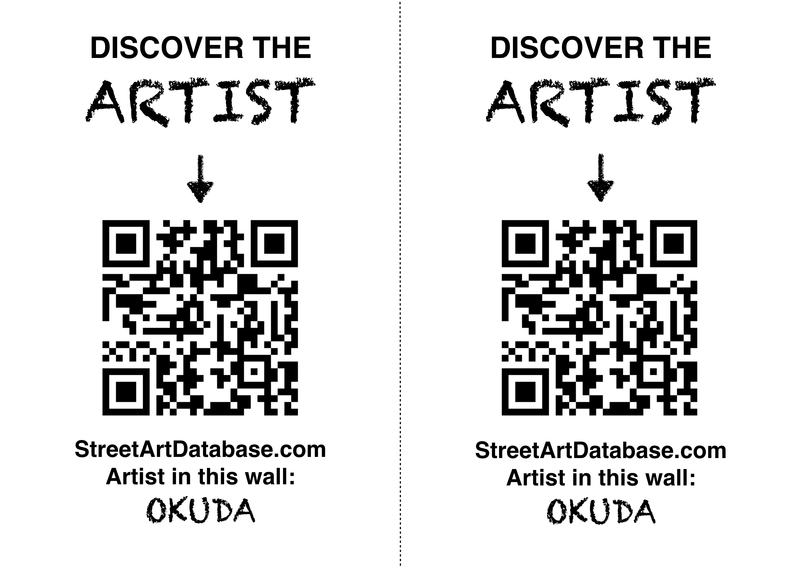 PRINT CODE: help tagging Okuda in the streets of your city!